I love the colour yellow - it's the colour of sunshine! 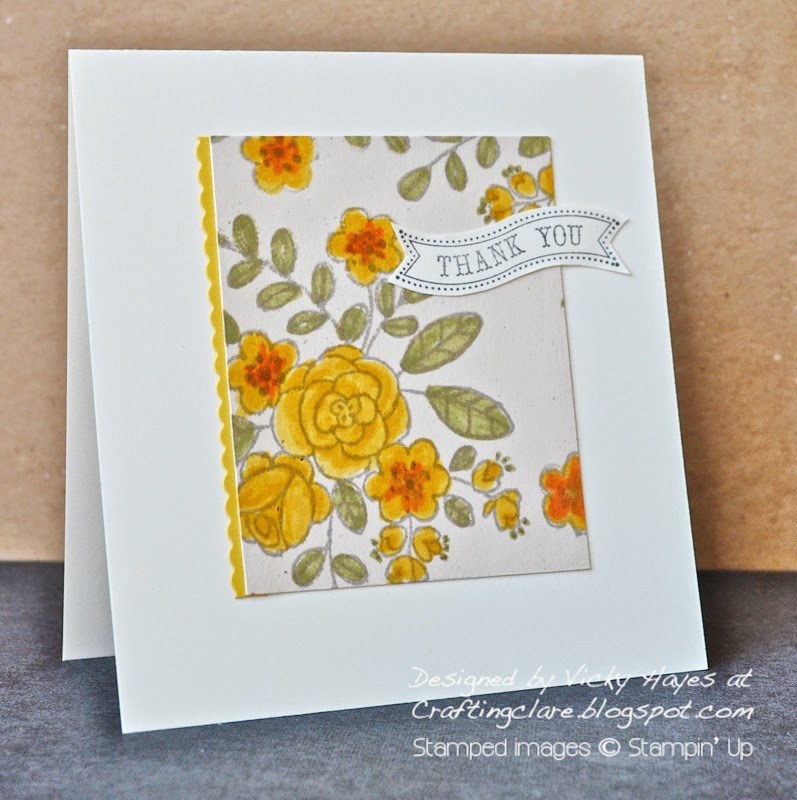 To make today's cards I used Stampin' Up's So Very Grateful stamp set from the spring/summer catalogue to stamp a whole sheet of Naturals Ivory card stock with flowers and then coloured them in using yellow markers. This is a very therapeutic activity and you end up with pretty floral card stock! I used mine to make this vintage-style card. The delicate scallop trim is one of the decorative blades you can use when you convert the Stampin' Trimmer into a rotary cutter with the rotary addition. I loved the way the curvy banner from Itty Bitty Banners looked with the vintage-style flowers. Here's a slightly different design made using the same goodies - the one sheet wonder technique is perfect for making a whole set of cards as a gift. We've been in beautiful Somerset over the weekend and enjoyed plenty of sunshine. On Sunday it was May 4th, or Star Wars day as my boys like to call it (as in may the fourth be with you!) How very apt then that we lunched in the ancient Ship Inn at Porlock and were seated in an area that had framed Star Wars posters on the wall! I know, Star Wars posters and this beautiful building wouldn't appear to mix would they?! We had an excellent roast lunch there though and the staff were friendly and helpful, so we'll definitely go back. Oh Porlock looks so pretty - haven't been there for many years. Your pretty dose of sunshine on your card is lovely Vicky. I love the card, Vicky - I'd like some fabric in that pattern, wouldn't it make a gorgeous dress? The wavy banner is perfect. Ah, lovely Somerset, I'm sure you had a brilliant time. Porlock makes me think of Coleridge's Kubla Khan; he claimed he was interrupted while writing the poem, inspired by an opium-fuelled dream, by a "person from Porlock". These are lovely Vicky! Glad you had a lovely weekend! I love the idea of using this stamp to make a one sheet wonder Vicky. Looks like a lovely place for a weekend getaway. Beautiful Vicky, so Spring and Summery. The added detail of yellow card is brilliant. Did you drive up Porlock Hill? I remember it being very very steep, I certainly wouldn't try it in my little car, would probably kill it! Beautiful card, love the way you created depth in the petals. Love all the yellow on your card. So cheery. I long to return to England. Makes me homesick to see the lovely buildings. England is not my home but I do love it! This resonates with me on many different levels Vicky - not only do I love your gorgeous card, but your comments also bring back memories of holidays in Devon/Somerset, visits to Porlock, thoughts of my sons who would love the "Star Wars" joke (but probably already know it), and, lastly, the comment above by pastcaring about the 'person from Porlock' who interrupted Coleridge when he was writing Kubla Khan! No, I'm not an English Literature graduate, but aspire to be (despite my advancing years). All that from one blog entry! Amazing.